Occupy Wall Street websites love adding Google, Facebook, and Twitter buttons–which could give law enforcement a handy back door to track users’ actions–and identities. Big Data is everywhere. Occupy Wall Street protesters, however, are dealing with a special challenge: Online marketers and analytics firms tracing the minutiae of their lives–including their email contacts and physical location–and possibly passing the information on to law enforcement. According to technology researcher Tim Libert, protesters affiliated with the Occupy movement have unintentionally aided and abetted corporations in tracking them through social media and analytics plug-ins. Popular web analytics tools such as Google Analytics and Sitemeter, it also turns out, repackage website information for corporate clients. These corporate clients can then pass on information to law enforcement agencies willing to purchase the data. 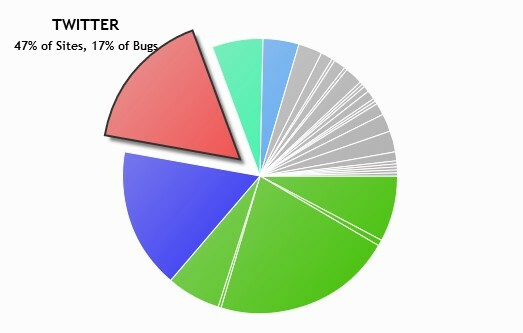 Twitter, Facebook, Google Analytics, Google Calendar, Google +1, and WordPress Stats were responsible for the bulk of the tracking bugs on Occupy sites. Google, WordPress, and other vendors don’t offer their invaluable (and free) web services altruistically–the price paid by the general public is detailed analysis of their personal habits. And Libert claims that it’s just a short leap from there for Google, for example, to extrapolate the real name, address, and personal interests of an individual Occupy sympathizer by cross-comparing a user’s IP address across Gmail, Google Maps, Google Calendar, and Google Search. The chart below, provided by Libert, gives a basic idea of the breakdown of trackers found on Occupy sites; an interactive version is available here. While it is a given that cookies and the marketing and analytics firms behind them record a staggering amount of our online lives–whether we’re activists or not–it’s a special concern for the Occupy movement. Among the privacy activist community, it has long been an open secret that law enforcement authorities routinely purchase aggregate social media marketing data to circumvent privacy laws. At the 2011 World Media Summit in New York, Jay Stanley and Susan Herman of the American Civil Liberties Union (ACLU) disclosed that the FBI voraciously purchases marketing information on U.S. citizens from data aggregation firms. Local law enforcement agencies also routinely track citizens’ locations via GPS, often without a warrant. The larger issue here is the ubiquitous marketing-driven soft surveillance found on the web and in the smartphone app world. Through an unconscious process of technological innovation and demand for free web services, an ever-present industry of web surveillance has been created to pay the bills for the Internet. As law enforcement agencies discover how consumer data mining and GPS phone tracking are a legal gray area, this will become a concern for all of us–not just Occupy Wall Street protesters.